Selecting the right hardware is a challenge. For business users who want great value and reliability, a Dell Partner Direct solution is the right choice. Offering a full range of hardware solutions for server rooms, offices and mobile workers. Our direct access removes layers from the distribution chain and delivers the right solution at the lowest cost. GMA work with any hardware you may have. 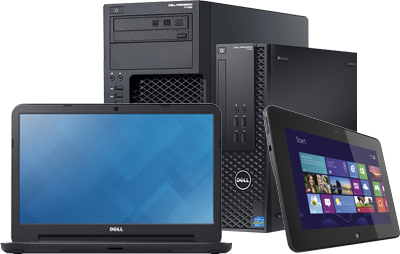 We recommend Dell as they offer the best range of hardware for your organisation. Whether it is servers, centrally managed desktop PCs, or powerful laptops that keep any staff on the move working at full efficiency, Dell have a solution. Their range of machines is so vast, that understanding which option to take is a challenge. That is where GMA come in. We have the expertise to know what you need. Every business is unique and with so many configuration options, we can select the right hardware combination for you and your organisation. Buying your Dell hardware through GMA gives you access to experienced technicians and support personnel. We can deliver a complete sourcing and installation that works for you. Our experienced provides training for your team to make the use of their new equipment and support to ensure that everything is up and running as you need it. When it comes to extracting the most value from your purchases, GMA are your trusted Dell Partner Direct provider. We can source, install and set up all your Dell equipment. Why do it yourself?